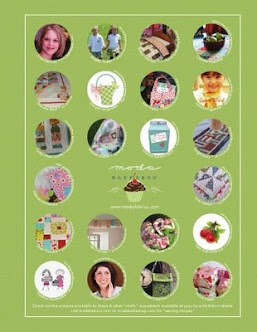 bitty bits & pieces: 50th Birthday & Moda Giveaway! Well, the time has finally come to. . .
And what better way to celebrate than to have a. . . 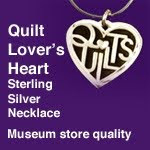 I will be giving away quite a few things, so scroll on down, have a look see, and enter the giveaway. Here's the first thing that I will be giving away. 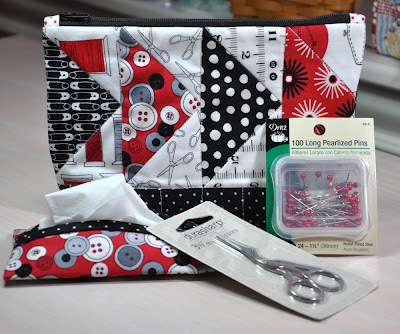 It's a Handmade By Me Sewing/Makeup Bag with matching tissue holder, sewing scissors, and matching pins. This is my newest favorite fabric, too! I made 12 of these bags for several of my sewing friends and while I was at it I made sure to keep one for this giveaway. In addition to the sewing bag I will be giving away ONE Layer Cake of Fruitcake by Basic Grey in celebration of my newest Moda Bake Shop Project which you can see HERE. I'm also giving away 4 tissue holders to 4 lucky winners. Tutorial for tissue holders is located HERE. Leave a comment on this post for one chance to win. Post about the Giveaway on your blog then come back and leave me another comment for another chance to win. Be or become a follower then leave me another comment for another chance to win. Jump over to the Bakeshop and leave me another comment for another chance to win. I will pick 6 names and the first two names will have a choice of the two top prizes and the other four names will win the 4 tissue holders. Happy Birthday! Great giveaway! Thanks for the chance. Happy Birthday, Kim! What fun to have your daughter home. Thanks for the chance to win such fun prizes! 50, wow. Welcome to the best years, they are fun. What a wonderful generous way to share your day. Yep I'm a follower and have been for ages and pretty darned pleased I am too. Happy Birthday! Great giveaway! Thanks! I have posted about the Giveaway on my blog. Happy 50th birthday! These are all great items for the giveaway. But shouldn't we be giving you the presents? Happy birthday! And thanks for a chance to win a birthday gift. Happy Birthday! I wish you two another 50 years of sooo creative life! The giveaway is wonderful, thank you. Love the bag.... and the tissue holders make wonderful stocking fillers. Happy birthday! I am so happy that I found your blog!! Happy birthday! I hope you have a great day and do something special to celebrate! I've become a follower, you have a lovely blog. So nice to have found you! Kim , Happy Happy Birthday. Thank you for making the tissue holder tutorial. You wouldn't happen to have it in PDF format? Thank you for the chance to win. I am already a loyal follower and you are on my blog roll. I am already a follower and love it. Welcome to your 50's...it's fun!!! Happy Birthday!! Hope you have a brilliant day filled with happy memories! 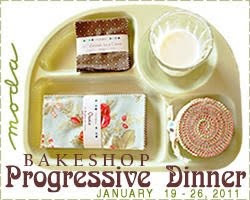 Please count me in...such lovely goodies! Happy Birthday. Just so you know, FIFTY IS Fabulous! It really is. Life is so much more settled. thanks for giving away some great prizes for your birthday. I left a comment on the Bake Shop site. I would love to be a winner of any gift in your giveaway. I thought I was a follower but I am now. Happy 50th Birthday! I'd love to be entered into your generous giveaway. Happy Birthday! 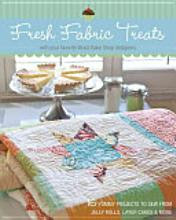 Great giveaway - love the advent quilt!!! Happy Birthday! Now the best is yet to be! Thanks for the chance to win. Lovely things you give away! Congratulations to your birthday! Wish you all the best and a lot of surprises! Thanks so much! I already enjoy to follow your blog and read your posts! Thanks for all your sharing! Happy Birthday! Thanks for the special giveaway. Happy Birthday! What a generous giveaway. Thank you! And I've followed your blog for some time! Happy 50th Birthday! Great giveaway, thanks for the chance. My first choice would be the make up/sewing bag. Those are my colors!! This awesome giveaway would be sweet to win on my birthday!! Thanks for the chance! Have a great birthday! I can barely remember my 50th - it's been so long ago! I love your advent pockets project! The ricrac accents are just darling! Pretty giveaways, too. Congrats on turning 50...I did it in March. Have no fear - it's great being 50! I love the fabrics. Hope I win. Thanks for the chance to win. Very nice moda project - I love advent calendars and that is a nice one! Thanks for the chance at the giveaways... great! Happy birthday you have a great dayHope your doing something special. Love your giveaway - so cute and useful at the same time! Happy Birthday. These are so cute. You're such a talented person! Happy Birthday Kim! What a fabulous giveaway! Thanks for sharing. Prizes or not, Happy Birthday! The fifties are awesome!!! Enjoy them. How nice to share gifts with us!! I am adding the link to my blog. Happy Birthday Kim! I am now a follower of yours, just found your blog today. Great giveaway!! fun giveaway and tutorial thank you! You look far too young to be 50!! Have a wonderful birthday!! Thanks for the entry to your give away! I have my fingers crossed! Happy 50th! Have a great day! Happy Birthday! What a generous giveaway! thanks for the chance to win! I've also become a follower! Happy Birthday to You! I am a follower! Happy wonder*filled birthday to you! I love how easy google makes it to follow when you find such inspiring blogs. Happy Birthday, Kim! What fun prizes, too! Thanks for sharing! Happy Birthday my dear! Hope you have a great one. I'm a follower since our lovely lunch. A Very Happy Birthday Kim! Hope you have a wonderful day and thank you for the chance to win in your lovely giveaway! I have been following your blog for a while and am really enjoying it! I'm a follower! And loving it! Happy Birthday! 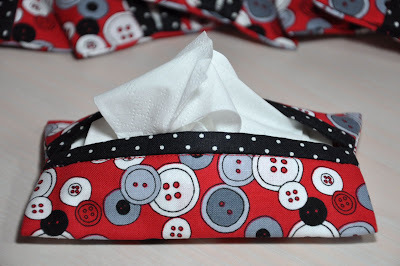 I love everything...I've never made the tissue holders before but definitely want to make some! And I love your Bakeshop tutorial as well! Oh and happy Christmas to you!! Happy 50th birthday! I loved the Bakeshop tutorial and I think I will make this for my grandson to use next Christmas. He is just old enough now to get really excited about the holidays. Happy, Happy Birthday. I love the fabric you used in the cute bag. There is something striking about black, white and red together. 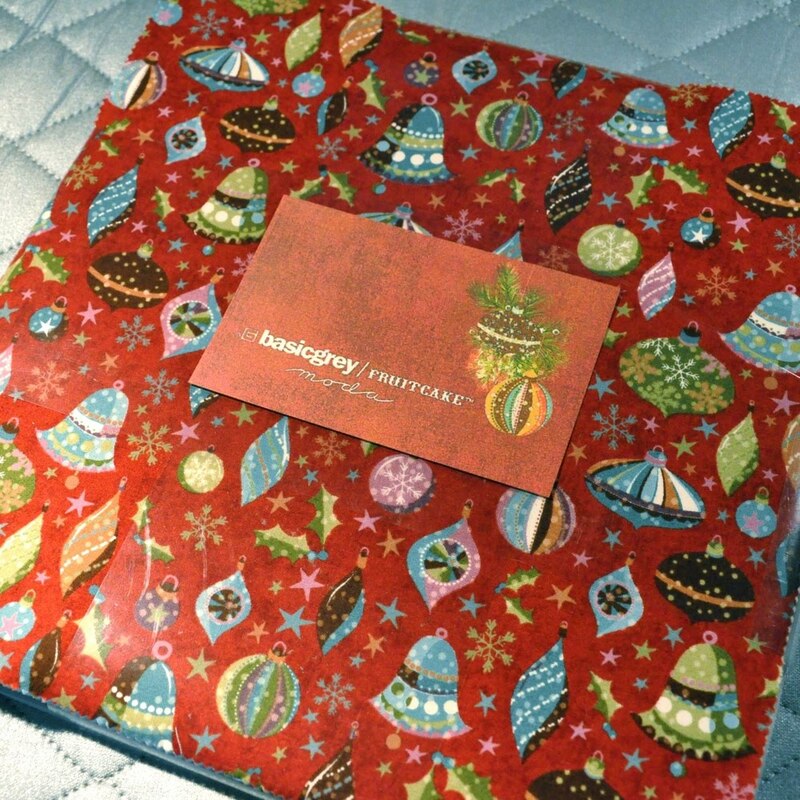 Thank you for the chance to win a fabulous gift. Happy Birthday! What a great giveaway to celebrate! Thanks for the chance to win! 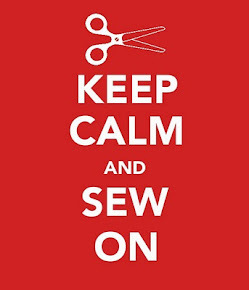 So glad I found your blog through Moda! It's great! I left a comment at Moda. Happy 50th Birthday! I joined the 50 Club last year. It was a very memorable year - I got my first grandbaby and also retired from teaching. The extra bonus it that I get to babysit my granddaughter every other day. I have been reading your blog for quite some time, but today am officially a follower. Love the black and red. I like the red and black fabric! Thanks for the chance to win!!!! I am already a follower! Love your blog. The quilt is adorable. 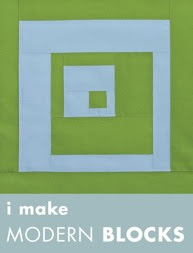 I can see using the block for maybe a nap-time quilt and hide little pictures. Thanks for the giveaway. great giveaway....Thank you! And Happy birthday! Happy Birthday! I am a follower! I have posted about the Giveaway on my blog. I have been a follower of your blog and you make the most beautiful things. I love this giveaway and have been missing your posts. I am already a follower and a facebook friend. I don't have a blog but guess I am going to have to start one. I'm already a follower, so guess this one counts as two?? Thanks. I love the big pockets on your Advent Calendar. That's what I have been looking for. You can put more than a little piece of candy in one. Thanks for all your inspiration and sharing with us. Happy Birthday. Heres to 50 more! Happy to say I am now a follower! Happy 50th! Such lovely prizes! I love your advent calendar quilt...so clever! Happy Birthday!! It only gets better after 50. Thank you for the tissue holder tutorial. Such a nice gifty. :) And what a fabulous giveaway! Love your blog and ideas! Keep up the good creative work. Thanks for the chance to win! I really enjoy your blog and am a follower. Thanks for another chance to win!!! What a nice giveaway! Thanks for the chance to win!! Happy birthday and thanks for the giveaway. Congratulations on your success with Moda (*sigh* in my dreams). Happy 50th Birthday! Thanks for letting us help you celebrate!! I'll have to spiff myself up a bit if I want to look that good at 50! Happy Birthday! I posted about your giveaway on my blog at http://runtomomma.blogspot.com it is a good time of year to share the good news. Happy Birthday Kim!! We share the same 50 year mark this year, except I turned 50 in September. Love your little projects. They are so fun and in such fun colorways. 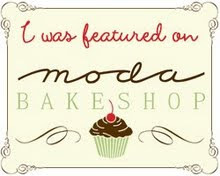 I'm on my way over to Moda Bake Shop to see what delight you have over there!! I'm celebrating my birthday today so I think since we both have december birthdays that I should win!!! I would love a chance to win this! Great giveaway you are having. thanks for a chance. This is my first visit to your blog.....very nice. Will be visiting again for sure. Happy Birthday!!! My birthday is on the 20th of December, and I always end up getting gypped. I hope that's not your experience. Lovely prizes. Thanks for the chance to win one. Happy 50th Birthday. Hope you had a great one. I am a follower, and love your gifts. Love that fabric too. I am going to have to try to find it. Thanks for the chance to win. Happy Birthday! I love the button fabric you used, so stinkin' cute! Happy birthday! I follow your blog with Bloglines. Love your gifts and would be thrilled with any of them. I'd love to win! Count me in. I love that little bag. It is perfect. Thanks for offering it in a giveaway. I have so much fun reading your post. Thank you for sharing your ideas and craft items. I am a follower. Thank you for the give away. HAPPY 50th, Kim!!! Very nice prizes you are offering....and how kind of you to do this. Wishing a wonderful 50th year Kim- I have been enjoying my 5th decade for the past 4 years alot. It is a terrific time of life. You have created some lovely prizes for your winners. They will be thrilled when you choose their name. Thanks so much for the opportunity to win something handmade by you. I am one of your followers too- You have created some lovely things for the Bake shop tutorials. You are one generous lady- Thanks so much for your kindness.